When Harvard president Lawrence S. Bacow stressed the vital role of immigrants in both higher education and the economy during his October installation address, economist William R. Kerr’s research team cheered. The D’Arbeloff-Class of 1955 professor of business administration, Kerr studies the future of work, with a particular focus on high-skilled immigrants and their impacts on the U.S. economy. 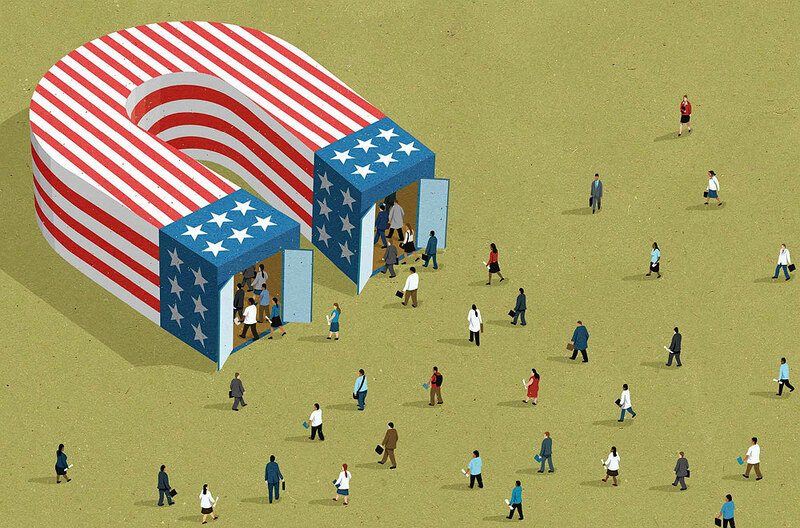 At a time when immigration provokes fierce debate in American public life, he argues in The Gift of Global Talent (Stanford) for reforms to streamline the U.S. immigration system and attract more overseas talent. Using databases of Nobel Prize-winners, inventors, and college graduates, Kerr has found that immigrants contribute an outsized portion of U.S. innovation. Since 1901, for example, 33 percent of the country’s Nobel laureates have been immigrants. In 2014, 40 percent of America’s doctoral degrees were awarded to noncitizens. Data from the Longitudinal Employer-Household Dynamic database suggest that more than a quarter of U.S. entrepreneurs were born overseas, this number having risen steadily since at least 1995. Such patterns are more difficult to discern among inventors (patents do not list the holders’ immigration status), but Kerr uses algorithms to approximate inventors’ ethnicities from their first and last names, yielding insights into workforce patterns within firms even when immigration patterns cannot be observed directly. Using this method, Kerr estimates that likely immigrants accounted for roughly 29 percent of U.S. patents in 2017, up from just 9 percent in 1975. Immigrant output has increased faster than immigration itself, and this growth is clear across sectors. The impact of these immigration patterns reaches far beyond the clusters themselves. In an interview, Kerr argued that “the economy as a whole becomes richer” in the long run as a direct result of high-skilled immigration. His research suggests that native-born residents also display more creativity in places where many immigrants work in innovation industries. There can be drawbacks, of course: older workers in information technology may face unemployment, for example, or an influx of innovation workers may price other residents out of the housing market. Nevertheless, Kerr’s economic models indicate that the trend’s overall effects are positive. Although Kerr thinks the United States should be more welcoming toward immigrants in general, he specifically stresses the need to expand and streamline its procedures to attract and retain more talented immigrants, in order to drive economic growth. Likely candidates generally arrive through employment-driven programs like the H-1B visa program: employers sponsor prospective workers, and the visas are awarded by lottery. This system allows the economy to select for the workers it needs most, but the limited number of visas available and a chance-driven selection method muddle the process. Suggesting that the country “could align the pipes a lot better,” Kerr proposes several reforms, including guaranteed work visas for non-citizen graduates of U.S. colleges, an increased H-1B minimum wage, better allocation of scarce visas through wage-ranking (prioritizing those immigrants who will receive the highest wages from their sponsoring companies), and a preference for immigrant entrepreneurs. “The responsibility for these reforms,” he suggests, “would lie with immigration services, the White House, and Congress,” and the results would be a clearer process, a higher-skilled immigrant pool, and greater economic output. Polling data suggests many Americans would support such reforms: 60 percent of registered voters in a 2017 national poll by Politico and Morning Consult (a survey-research technology company) agreed that high-skilled immigration should be increased. Far fewer respondents currently endorse expanding the H-1B program specifically, but Kerr believes that increasing the skill level required of H-1B visa holders could also strengthen support for broadening that program. He sees an opportunity in these polling numbers—a hint that the United States can chart a path forward even amid the current moment’s contentious immigration debates. Only by doing so, he argues, can the country retain its edge in the world’s innovation economy.